Sabbath is traditionally Sunday (from the Christian tradition) or Friday-sundown to Saturday-sundown (Jewish tradition), but perhaps some other day works better for you. Set aside one 24-hour day every week for a personal retreat. If you can't manage more than half a day, then start with half a day. The important thing is to set aside a specific time each week for stepping back from work, from demands that you produce. other creative pursuit (painting, writing poetry or fiction -- again, as long as it's not your job). You may also want to give yourself some prohibitions. Options might include, "no caffeine or alcohol" (allow yourself one day to confront life without mood enhancing substance), "no TV" (allow yourself time away both from work and from mindless distraction), or "no purchase or consumption of animal products" (one day a week of being vegan may help you feel more connected to life). Select rules for yourself that enhance the experience for you and that you feel good about. Whether or not you add any such rules, the main point of Sabbath is to put aside your work, put down the preoccupation with producing, and take a day to "lie fallow" and regenerate. 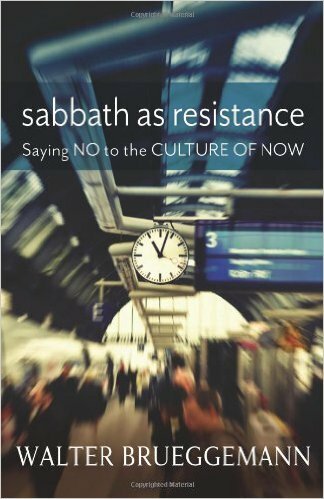 Take a look at Walter Brueggemann's 2014 book, Sabbath as Resistance: Saying No to the Culture of Now. Keeping Sabbath is a counter-cultural act. It means resisting the anxiety, coercion, exclusivism, and rushed multitasking that contemporary life demands. Modern society has elevated striving to such a height that it has become, for us, a spiritual disease. Life is not reducible to production and consumption -- a truth we are apt to forget if we do set aside Sabbath time in our week. You do not have to do more, sell more, or score more. You do not have to control more. You do not have to know more. You do not have to have your kids in ballet or soccer. You do not have to be younger or more beautiful. Each week for the first 4-6 weeks of keeping Sabbath, write in your journal how you experienced it.